Today I'm sharing our recent visit to a local cider mill and orchard. Just a 45 minute drive from our house it didn't take long for us to get there and participate in some fall activities! The first stop was Clyde's Cider Mill in Old Mystic, CT. This is a local place that everyone constantly talks about but I've never been! Tim and I actually planned on heading there all week but our friends Fred and Marissa actually asked us that morning if we wanted to meet them there which was perfect since we already planned on heading that way! We got to Clyde's a little before Fred and Marissa so we starting scoping out the area and saw there was a free wine tasting. Neither of us are big wine drinkers but we had heard good things about the cider and apple wine so we decided to check it out. We each tried four (some overlapping) and found the Spider Cider and Black Out to be winners for both of us! us. They were surprisingly affordable at about $13 per bottle. We tried some other products different vendors were selling and looked around the store a bit before getting in line and meeting up with Fred and Marissa to get some cider. The cider slushie was super tasty and the cider donut was great as well! We didn't buy any pumpkins since we are in a second floor apartment and pumpkin carving seems like not a great idea when we don't have an outdoor area to put them. However we did pose with some! 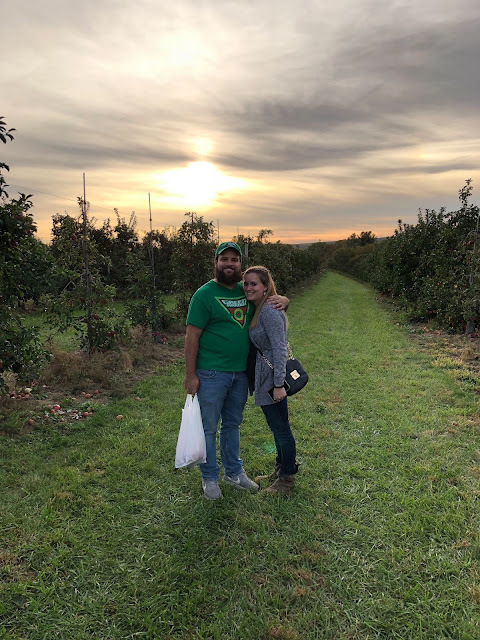 Once we had our fill of wine, cider and donuts we headed over to Holmberg Orchard to go apple picking. It was absolutely beautiful weather and a great day to be outside! There weren't a ton of different types of apples to pick from but we had a great time choosing a few apples to take home with us. One of the rows of apple trees was called wine sap and Tim thought they were absolutely delicious so that was definitely a good find! It's also so cool to pick your own food instead of getting it from the grocery store. We had a great day and enjoyed spending time with Fred and Marissa as well. Fall activities are so fun and I'm glad we had the chance to get out and participate in some!